Leading Brokerage House LKP Securities has come up with 7 picks in its latest research report. The Head Research at LKP, Mr. Mr. S Ranganathan and Head Advisory at LKP of Mr. Kunal Bothra are very confident about Indian Economy going forward. They point out that there are a lot of interesting developments which have occurred in the recent times even thought market had lot of ups and downs. Global concerns have never been so visible in the recent past, and with bounties of concerns over China, sovereign downgrades of countries like Brazil etc, Currency crisis etc. Along with it the FED maintaining status quo and the RBI cutting rates despite a 14% deficiency in the monsoon it is quite evident that slowing global growth is uppermost in the mind of central bankers. Picked due to a good consumer franchise and key metrics which have not deteriorated much in the midst of challenging business environment. DCB with a market capitalization of 4000cr is well capitalized with a capital adequacy of more than 14% and has a strong presence in Maharashtra & Gujarat. Mortgage loans continues to be the priority for DCB. 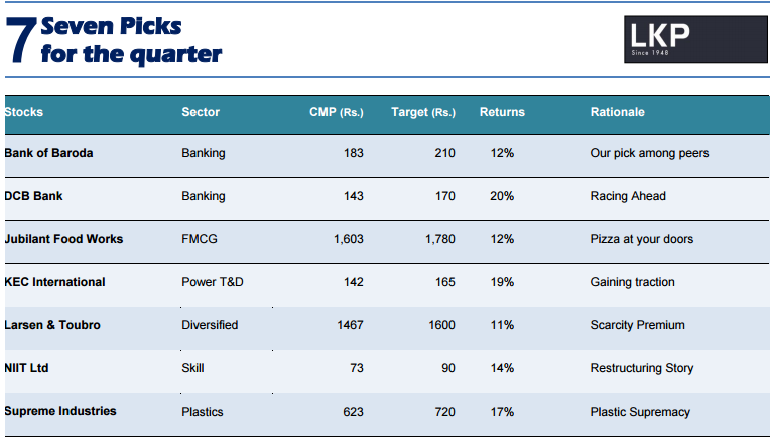 Expecting DCB to grow its balance sheet by 23% this year and the bank does not need capital to grow for FY15-16. L&T to play the Engineering, Construction & Infrastructure theme in India and is a proxy to the revival in investment cycle and traction in Defence & Aerospace. With its order backlog at the end of the first quarter growing at more than 20% we are positive on the outlook going forward given its management bandwidth and execution capabilities. New Business Opportunities arising from the Skill India program of the GOI and the re-structuring initiatives at two of its divisions – School Learning & Corporate Learning should in our view enable a business transformation and propel NIIT going forward.